Gain 2credit and draw 1 card. Remember Build Script? 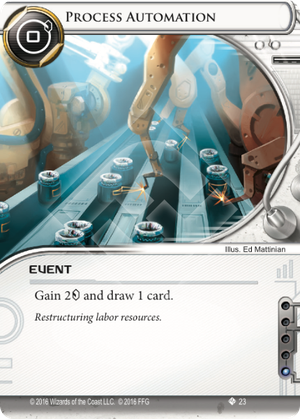 This is FFG saying "never design a weak card if you can design two". Most of the objections to Build Script apply here as well. In effect Process Automation lets you gain 2 for 1 click and replaces itself in the process. In order to do so it takes up a deck slot and an influence point. I don't know about you, but I prefer clicking twice for credits a few times in a game and using deck slots for something that advanced my game plan more. On the bright side you can Process Automation to draw Wyrm and gain the credits to install it and still have one credit left! Sometimes you just have to make plays to see the look on your opponent's face.